Run, Run as fast as you can! Can you avoid the sneaky fox and keep all of your ten frames? This holiday themed math game is designed to build number sense through subitizing. Ten frames help students see the structure of numbers and gives them confidence as they begin to explore quantities. 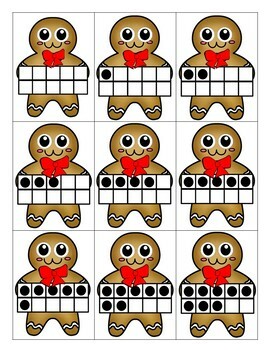 Perfect for your classroom Gingerbread theme, or after reading the Gingerbread Man story! 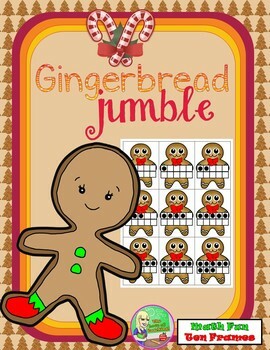 Activity includes cards with a variety of ten frames (1-20), along with “Crazy Cards” designed to keep the game going and a BONUS Color by Number Gingerbread sheet. Ideal for small groups! This game can be played as a guided math center or collaborative group work or a homeschool math lesson. Directions: Begin the game by placing the stack of cards, face down in the middle of the table. Each student draws one card on their turn. If they can recognize the number (without counting the dots individually), they can keep it. If they do not know the number, the number is told to them and the card goes back to the bottom of the pile. OH NO! The fox tricked you and now you have to put all your cards back! If you draw a COW card you can steal a card from any player of their choice. 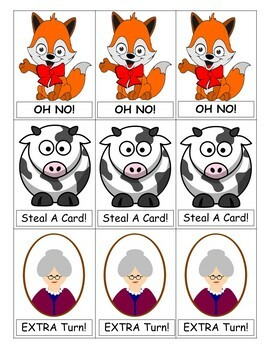 If you draw an OLD LADY you can have an extra turn because the little old lady saved you from the fox! How many times have you had students leave their math center and say, “I’m Done”!? This game is never ending due to the “CRAZY” cards! So you can keep teaching math groups without interruption! Preschool: M.P.1.1 Demonstrate use of one-to-one correspondence in counting objects and matching numeral name with sets of objects. Kindergarten: K.CC.B.4 - Understand the relationship between numbers and quantities; connect counting to cardinality. First Grade: 1.NBT.B.2.B - The numbers from 11 to 19 are composed of a ten and one, two, three, four, five, six, seven, eight, or nine ones. Thank You For Your Purchase! I appreciate you! Happy Subitizing!